The Christmas Jumper Countdown to Christmas — ODDKID. For nigh on a decade, I've been sending my best friend Owen inspiration for his annual Christmas jumper. As the first person I knew to get a "real, proper" job straight out of university, I was able to spend vicariously through him - enjoying many a deep knit holiday sweater throughout the late noughties. And so, while it's been some time since I captured the selection publicly, I thought it might be a nice respite from all the "100 tech trends on Snapchat" and "A million things you've already forgotten to do in 2016" lists. Owen - and the gentlemen readers of my blog - this one's for you. 1. No self-respecting festive knit aficionado should ever embark on their hunt without first consulting the thought-leader of crimbo tops - Ralph Lauren. Every year R-Lizzle blows our tiny, mince pie sozzled minds with another experimental foray into solstice attire. 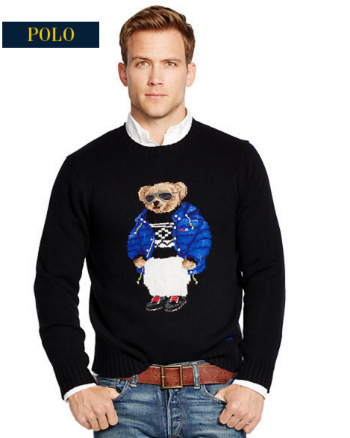 This time, he stretches the boundaries of the genre once again through an intarsia-knit with a Polo Bear in après-ski attire. Just wow. 2. Now we've established best-practise. 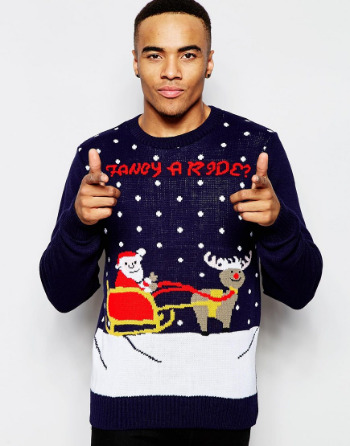 Let's head on down the other end of the spectrum to ASOS's 'christmas jumper' filter. And look, it's Banter Claus! Because nothing says "I'm going to get the morning after pill" more than finding this monstrosity in your bed after the work xmas party. And by monstrosity, I mean the man who saw this online, ordered it, and wore it in public. 3. A true gentleman, and follower of fashion, would instead head over to Mr. Porter and select this little number from Givenchy. It's edgy, it's design-orientated, it's for the man who sees what he wants and seizes his prize. Because, frankly, what girl doesn't want to hear those three magic words on her lover's lips? Flocked jacquard wool. 4. Maybe you're after more of a Zuckerberg vibe? You want your yuletide garb to be Valley, Roundabout or Beach appropriate as well as Medium-friendly race, gender, religion and channel agnostic. No fancy patterns for you, you're committing code not righteous acts of fashion. Plus, in Everlane's famous breathable cashmere, you can race from SoulCycle to the Tesla without skipping a beat or a Slack notification. 5. When it comes to Christmas morning, though, I have to advocate both style and substance. You need performance in every sense of the word - knitwear that sees you through the meat sweats, the compulsory family walk, and the selfies you post with that new selfie stick your Aunt got you because you're "in media" (aren't we all?). For this, it's only right to turn to JC. No, not that one, but happy birthday mate. The other one, J. Crew. Classic and classy - just like you.